(STAND HARDWARE ONLY). NO GRAPHICS INCLUDED! 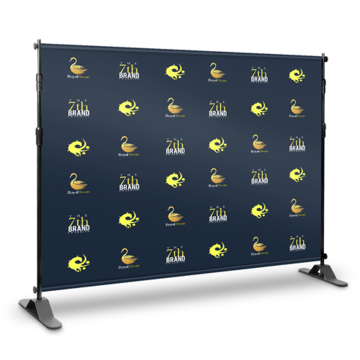 Constructed of strong and rigid aluminum, capable of withstanding moderate weather and a fabric insert that won't retreat from the rain, the step & repeat backdrop stand is a fantastic option for trade show booths and photo shoots alike. These stands have telescoping 2" diameter poles that extend out, meaning they are adjustable to certain sizes. Stand includes travel bag. Fits banners up to 8ft x 8ft.